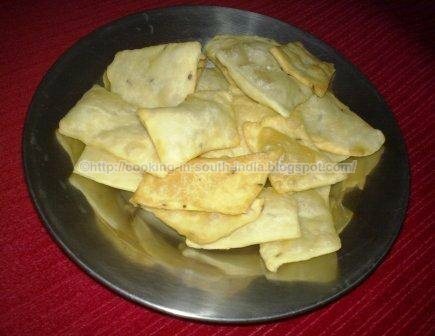 Maida Crackers is a Soft, tender and Crispy recipe, this is a South Indian style of recipe and quite different in taste like Mexican Corn Tortillas. Kids likes to taste Maida Crackers as a evening Tea time snack. In a bowl add Maida, Cornflower, Cumin seeds, salt and mix with Butter and water. Make it like a (Chapatti) thick dough roll them flat with a rolling pin cut into a diamond shape. Deep fry it until become golden brown. Serve with any chutney or ketchup.